With all the stories and books I read for the show and on my own, I think its about time that I share some of what I find with you - the Listeners. It is always a difficult choice to make - "What book do I read next?" Fiction, non-fiction, sci-fi, fantasy, mystery, romance, thriller, history, classical ... hopefully, with some of the recommendations I plan to give on this new page, I can help some of you out with all that. If you are an author and would like one or more of your works to be reviewed and featured on this page/advertised on the Bob's Short Story Hour podcast - please visit our Submissions tab for instructions on how to do just that. Book 1 & 2 in the Dr. Drake Cody series. "A fast-paced medical thriller, every chapter of which defies the reader to put it down for the night. Real-world heroes and villains, love, lust, greed, and mystery wrapped up in the lives and environment of an urban emergency room. Nerve Damage is a must-read for any mystery or thriller fan." "Standing at an Angle To my Age"
As you long-time listeners also know, from 2017's podcast day special episode of the show, the story "But No, Nothing" by P.W. Bridgman is an award-winning and fantastically written fictional drama set in Ireland. If you are like me, that story had you wanting to read more of P.W. 's fantastically real-life dramas which can be found in his collection of short stories entitled "Standing at an Angle to my Age". After being featured on the show, he sent me a copy of this book. I have shared a story or two from that book since on the show, but I highly recommend anyone to get a copy of this book and plunge yourself into Mr. Bridgman's world of storytelling. Some of you may remember Lois Greiman's short story "Iced" which was featured on episode 11 of the show. Well this is a nice window into the comedic mystery/crime drama that Lois Greiman brings to the table. Wonderfully witty, page turning, lusty, and at times suspenseful. I have to recommend the Chrissy McMullen series. 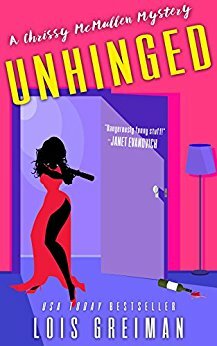 Book 9 in the series - Unhinged was released early 2017. These books are best when enjoyed from book 1 on, however, they do work as standalone novels.